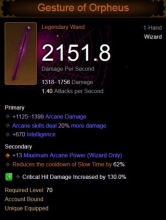 Wizard Blizzcon 2014 Report: What to do with our shiny new toys? I am beautiful. Love me. Fear me. 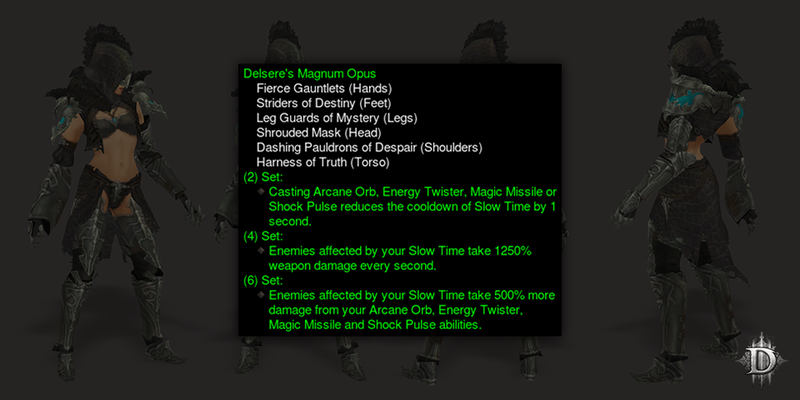 2-Piece bonus: Casting Arcane Orb, Energy Twister, Magic Missile or Shock Pulse reduces the cooldown of Slow Time by 1 second. 4-Piece bonus: Enemies affected by your Slow Time take 1250% weapon damage every second. 6-Piece bonus: Enemies affected by your Slow Time take 500% more damage from your Arcane Orb, Energy Twister, Magic Missile or Shock Pulse abilities. I must preface everything I say here with a gigantic asterisk as the playable demo on the show floor was a non-random, new tile set of Sescheron, and set a the (very easy) Greater Rift level 15. Meanwhile, our gear had our DPS at 883k and toughness upwards of 16 million. Thus, everything melted and literally nothing threatened your survivability. That said, the new affixes were interesting enough to draw out some speculation and bring some interesting questions to the table. The two-piece set bonus is nothing new or groundbreaking, and yet brought about some interesting gameplay mechanics. In the demo we were equipped with the Gesture of Orpheus. Pairing this with the new set bonus made Slow Time borderline spammable. More importantly, it allowed me to build crescent-shaped barriers by placing multiple bubbles. 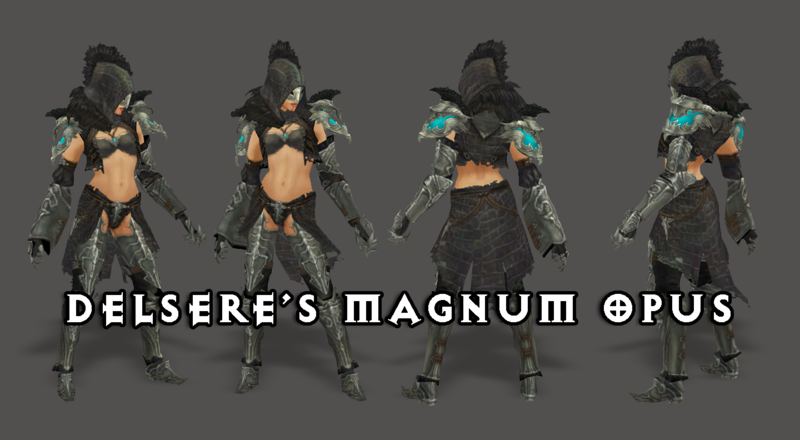 This at high greater rifts would be very useful for avoiding that hard hitting missile damage. Moon Clan Impalers just got less scary. Actively casting these spells not only creates bursts of damage or crowd control, but also greatly increases survivability in a more interesting way that flat mitigation. The four-piece bonus is where the gears really started turning. With the gearset we had equipped, I was seeing dot ticks of 130+ million on elites, comparable to my current competitive set in seasonal play now. The important thing to note is that there is no ramp up time, as is the case with this Firebird’s Finery. As soon as the the slow time debuff is applied, the mobs melt and numbers fly. While the damage is definitely comparable to the cookie cutter builds at the moment it comes in the form of a spammable crowd control, which is the one huge thing Firebird’s lacks. Control. Crowd controlling mobs inside the bubble makes the damage output even more ridiculous. Casting Glacial Spike on an enemy within the debuff does initial damage while also stopping the mob in their tracks. This allows for a few more seconds of the DOT tick, and at 1250% damage per second, Glacial Spike and other stun locking spells become far more useful at the higher levels of gameplay. 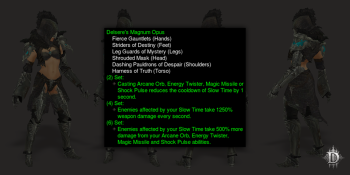 It is also important to mention that while the bonus says “affected by Slow Time,” it seemed that as long as the debuff was applied to the mob the damage was present, both inside AND outside of the bubble. This mean that with the new Crown of the Primus or Point of No Return rune selected you have effectively 3750% damage over 3 seconds (or 1250% damage per second) even after they attempt to escape the bubble, coming in the form of a stun from the rune effect by keeping them in the spell animation. If that wasn’t enough awesome, the six-piece bonus increases the damage of those spells outright. And as above, the damage increase seemed to apply to mobs on their way inside and outside of the bubble as long as they were caught in the stun. While I’m sure there will be plenty of tweaking and testing, the damage and synergies of this set were outstanding. You were seeing great, sustainable damage numbers coming from spells like Glacial Spike and Frozen Orb. I can only imagine what Energy Twister and Shock Pulse will feel like with these set pieces and debuffs applied. Unfortunately, they were not a part of the playable demo on the show floor. As I stated at the top of the post, it was hard to get a gauge on how powerful this set truly feels considering how much you outgeared the playable content. But numbers don’t lie. I’m trying to imagine what kind of damage we will be seeing with a well rolled Sun Keeper as opposed to the Gesture of Orpheus. Or to imagine how amazing it will feel to drop Energy Twister while equipped with the new Ranslor’s Folly in the middle of a Slow Time cast, pulling the screen in for an instant apply dot, while getting massive crits with your tornado and let’s say… Frozen Orb. What this set does, it seems, is give us some more viable options and a very different playstyle that I think will be very powerful even at high levels of play. A playstyle that is more casting-active than the Blizzard/Hydra/RUN!!!! builds most of us are using currently. And one that feels much more busy and mage-like. I had and absolute blast playing this in Anaheim and I’m looking forward to it going up on the PTR so I can get my hands on it again. Have no fear Frozen Orb fan-boys and fan-girls, Ice is back with a brand new invention. 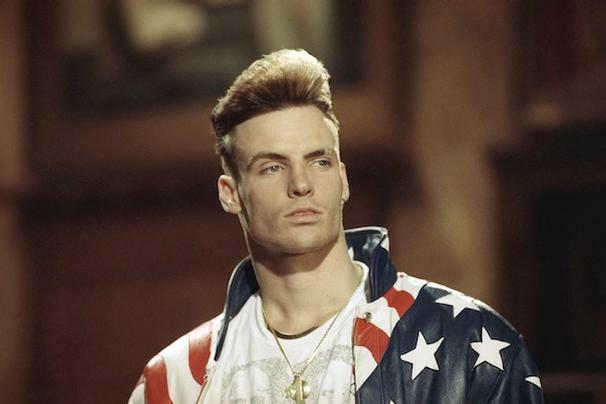 …Yes, that is a Vanilla Ice Joke. 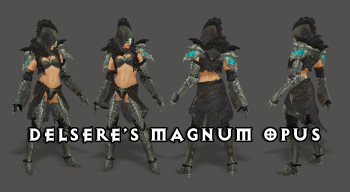 I am actually interested in this new set. It is pretty much the build I ran when trying to get my firebirds completed but I did it just to be useful to the group. I called myself a zdps wiz and just allowed the group to be more effective but now with an actual build around it I can say it will be the most fun I could possibly have on a wizard. Now if they could just fix monks I think s2 could actually be interesting vs s1 which had the most boring set builds in history. Glad to see Frozen Orb is getting some love. 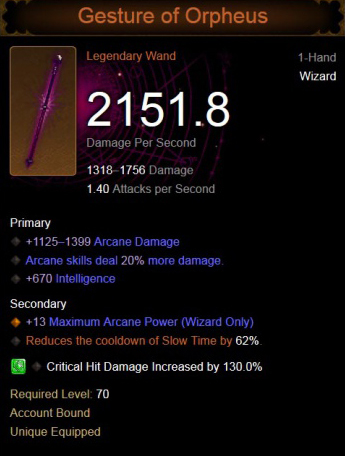 It was one of my favorite spells in Diablo 2..even though LOD made the spell blizzard the dominant ice spell because of all the synergies, because of this set; I will be rolling a wizard in the new season. 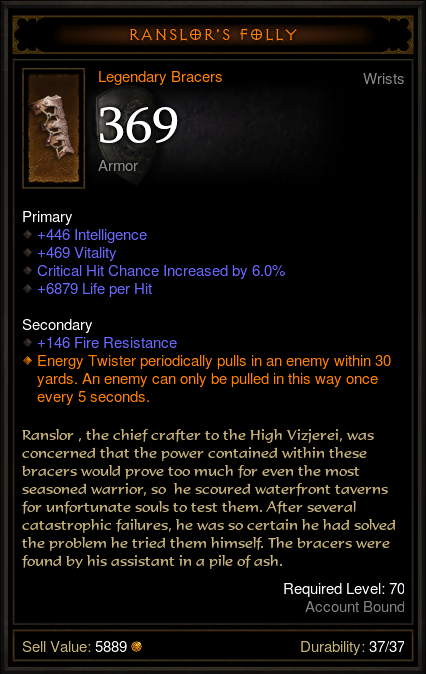 Looks like hope for the 1.09 style FO/Hydra/Storm Armor setup to climb out of the niche build section. The set seems thouroughly designed, if not overpowered. Throw in a mirror ball for 3 times the glacial spikes. Worth the dps loss of running with a Furnace? Also, in b4 nerf. I'm kind of wondering if the Archon slow time bubble will gain the set bonuses, or the Primus helm benefits. That'd be sweet if it did, but I doubt it will, since their probably treated as 2 different skills. The big question is what element try will be bubble DoT dmg. If its only 1 element then we have suddenly much less viable options to choose from. Have no fear DiabloWikiFrozen Orb fan-boys and fan-girls, Ice is back with a brand new *invention*. So much fail. Just verified you are correct and fixed it for continuity. Who knew I was off on my ice ice baby lyrics all this time? Good looking out!